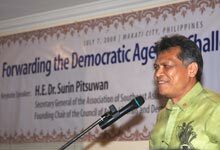 Calling himself the “cheerleader-in-chief” of the Association of Southeast Asian Nations (ASEAN), Dr. Surin Pitsuwan spoke of the importance of ASEAN in forwarding the democratic agenda in the region during a reception in his honor. The Friedrich Naumann Foundation (FNF), the Council of Asian Liberals and Democrats (CALD) and the Liberal Party of the Philippines (LP) hosted the new ASEAN secretary-general on 7 July 2008 at the FNF-CALD office in Makati City. Dr. Pitsuwan said that in the face of the growing power of China and India, ASEAN needed to become more relevant. It has thus created a charter to respond to the challenges of the region. He explained how the charter will give ASEAN a legal personality and consolidate the collection of diverse countries into a successful community. Dr. Pitsuwan was pleased to announce the charter’s ratification by six countries already and called on the Philippines to approve it also. Dr. Pitsuwan and Sen. MAR Roxas exchange ideas. LP President Manual “MAR” Roxas II responded to Dr. Pitsuwan by expressing the commitment of the Liberal Party to the ASEAN idea. The LP has a solid internationalist tradition and has strongly contributed to the development of Philippine foreign policy. This proud tradition was exemplified by the presence of almost all of the LP’s past presidents: Governor Raul Daza, former Senator Wigberto “Bobby” Tañada, former Department of Education Secretary Florencio “Butch” Abad and former Senator and CALD chairman Franklin Drilon. They expressed their support for a liberal at the helm of the ASEAN secretariat. In fact, former Sen. Drilon pointed out that the event was more of a homecoming as Dr. Pitsuwan was the founding chairman of CALD. CALD takes pride in the fact that someone from its ranks is shouldering the critical responsibility of helping ASEAN break new ground.